As a segment of its scholarship program, the Radio Club of America gave $3,000 to the Foundation for Amateur Radio (FAR) to pass along to three students engaged in the study of wireless communications and who have amateur radio licenses. FAR identified scholarship-money recipients for the 2006-2007 academic year. Two of the three recipients joined RCA as student members, which is good to see. I’m delighted to be able to offer you some information about one of the RCA-FAR scholarship recipients. My hope is that the information I’ll make available this year about RCA’s scholarship program will encourage you to contribute to the fund, if you haven’t already. I spoke with the scholarship recipient and student member by telephone on Feb. 18, 2007. Robert J. Bob Rodgers, WA3KOI, received one of RCAs scholarships for the 2006-2007 academic year via the Foundation for Amateur Radio. He also has joined RCA as a student member. He will be graduating from Gannon University in Erie, Pa., in May. How did you find out about the RCA scholarship? I saw it when I first went through the Foundation for Amateur Radio scholarship page. Thats the first time I saw it. You do the bulk application and send for all of them, and RCA gave me the scholarship a couple of years ago. Then last year, John Dettra (WA3BNF) offered me a membership, and I gladly accepted it. Im at college now. Ill be done in May. Im at Gannon University in Erie, Pa., in the northwest corner of the state. Its along the lake. Its a small school, primarily a medical school. Were next to a hospital. But they have a strong electrical engineering program and mechanical engineering. There is an unofficial partnership between the university and GE, which also has facilities in Erie. How did you select Gannon University? Because of the GE alliance. The place where they build the locomotives is here. When I looked for a school, I wanted to be able to get a co-op where you get work experience in your field while in college. Gannon said that is common, and although it isnt guaranteed, if you get good grades, the chances are good that youll get one. Ive been working at GE for a year now, and just finishing up. What have you worked on at GE? Ive been doing a little of everything. Some of it is like systems engineering. Something Ive worked on is a project that needed rework because the customer wasnt satisfied. Ive been the lead engineers intern. We rewrote the software and then as time went on, we tested it and took it through evaluation. I also wrote some fuel-saving software. A young Bob is at the left. How did you get started in amateur radio? My grandfather is Arlan Brandt, K3NE. He used to have my call, WA3KOI. That was his old call before he went to a four-letter one. Hes been an amateur since his 20s or 30s. He got my uncle and me into it. 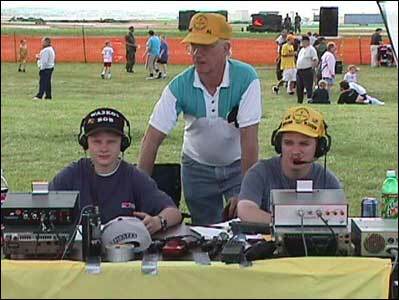 We used to do Field Day every year, and a special-event station at an air show every summer. Im less active now that Im in college. He got me interested in amateur radio, and as time went on, my interest went into general electrical engineering. I got a job in the power industry in a town on the other side of the state, Allentown, at PPL. Ill be doing planning and some other things. I dont know everything Ill be doing, but some of it will be power planning and grid reliability. What was some of your coursework? We had electronics courses and worked with amplifiers and BJT transistors. That was more during my sophomore and junior years. As time went on, Ive been more in theoretical classes without labs. Im in a senior design class where we have everything from project planning and typical engineering work environments. Right now, Im working on power distributions and interfaces so you can turn power on and off easily. Thats a group project we all work together on. Our class has become smaller over the years. We started with 30, and were down to seven now. Its common for many people to drop out and move into other majors, but losing as many as we did might be a little more than normal. Did the scholarship help you much? It sure did. I really appreciate it. It doesnt seem like a lot, but for you guys to have a scholarship, its meant a lot to me to be the recipient of that. It meant less borrowing on my student loans. I value that. I plan on being an active member of RCA. I see you have a conference at the end of February, but I wont be able to attend. Id like to support the foundation. Please join me in welcoming Bob as a member of RCA. Applications are also available electronically upon request to Scholarships@Farweb.org. This entry was posted on Thursday, February 22nd, 2007 at 3:37 pm and is filed under RCA news. You can follow any responses to this entry through the RSS 2.0 feed. You can leave a response, or trackback from your own site.